Lis is a qualified dental nurse with higher qualifications in intravenous sedation. She has worked with Ian since 1998 and helped develop the Implant Clinic at Torrington since its inception. She is a highly experienced implant nurse and regularly attends postgraduate courses and subjects on the subject. 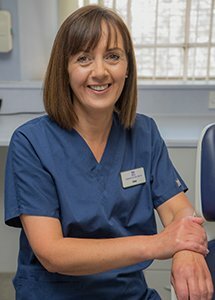 Lisa coordinates all aspects of the treatment within the implant clinic and as team leader, Lisa will be the point of contact for our Implant patients.